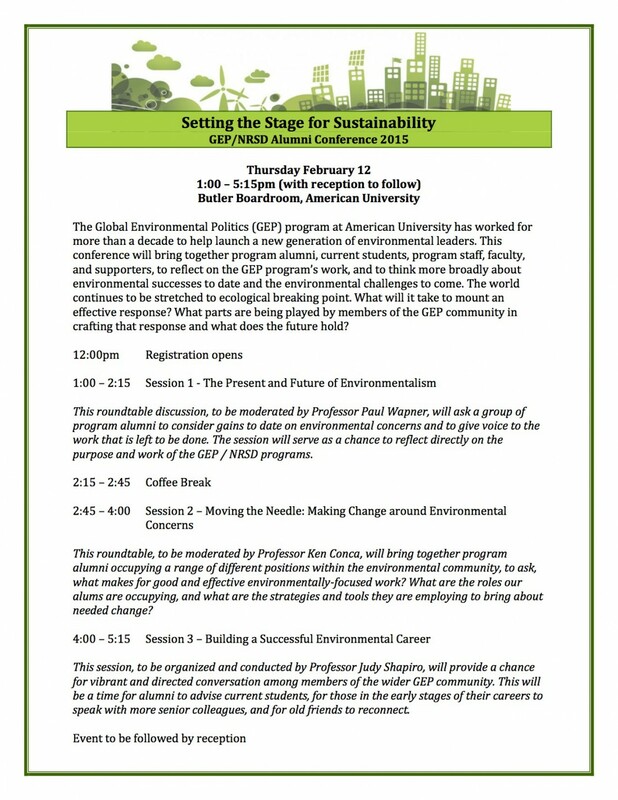 Come to this first ever GEP/NRSD alumni conference for a chance to take stock of our collective efforts, to reconnect with old friends and make new ones, and to examine the nature of effective environmental engagement. After the conference, please join us for a reception for current GEP/NRSD students and alumni in the SIS Abramson Family Founders Room from 5:30-7:30pm. Live Stream Info: Click here during the event for a live stream. Directions to Butler Boardroom: The Butler Boardroom is on the 6th floor of the Butler Pavilion. You can enter the Butler Pavilion by walking up the steps between the Mary Graydon Center and Battelle-Tompkins. The easiest way to get to Butler Boardroom is by taking the elevator next to the campus store up to the 6th floor. The double-door entrance will be on the right-hand side. Viewing of two films on Chinese environmentalism, Waking the Green Tiger and In Search of Sacred Mountain, and discussion with filmmaker Gary Marcuse. More info coming soon! Categories: Upcoming Events | Tags: Alumni Conference, GEP | Permalink.